Both the Bharatiya Janata Party (BJP) and the Indian National Congress (INC) claimed victory in the August 17 urban local body elections in Rajasthan. Both sides seem to have a point: the BJP won decisively while the INC strongly improved its performance in comparison with the 2013 state and the 2014 general elections. But it also seems true that the BJP hasn’t done as well as it might have hoped in urban constituencies that have long been its stronghold (as pointed out here and here). The fact of the BJP’s victory tell us little: the party has been so dominant in urban Rajasthan that it even outperformed the then-ruling INC in 2010 by a single percentage point. So how to evaluate these election results? Direct comparisons with state and general elections are a bit crude because local elections are driven considerably by local issues and candidates. Indeed the BJP’s winning margin in 2015 over the INC (3.4 percentage points) was pretty much the same as in 2005 (3.3 percentage points), the previous time it was in power. The results, in this context, are unremarkable and at best mark the return of “normal” politics to Rajasthan. Yet things aren’t quite that simple. The separation of urban local elections into two phases since 1994 provides us with a “natural experiment” that allows us to compare changes in urban support for the BJP between 2014 and 2015. 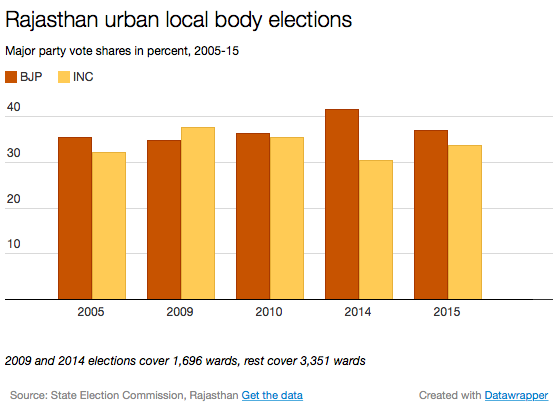 In November 2014, 1,696 wards in 46 urban local bodies had elections, while the August 2015 elections covered 3,351 wards in 129 municipal bodies. The chart above shows that, in November 2014, the BJP gained a sizeable vote swing of 6.8 percentage points in comparison with 2009, and the INC experienced a corresponding negative swing of of 7.2 percentage points. In August 2015, the swing towards the BJP compared with 2010 was only 0.8 percentage points, and the swing away from the INC 1.6 percentage points. Differences in absolute levels of support between the two phases don’t matter here: we are concerned only with vote swings. This isn’t a perfect measure because it assumes that, as of 2014-15, the choice of whether a ward had elections in November or August was essentially random (any evidence, for or against, would be welcome). Plus some of the candidate qualification rules changed prior to the August election and many INC and BJP candidates run as independents in municipal elections. Even so, this is us the closest we have to a yardstick of the change in urban support for the BJP between November 2014 and August 2015. Another way to think about this is in terms of the vote foregone by the BJP between the two rounds: a hefty 6 percentage points. Something seems to have changed between November 2014 and August 2015. Rajasthan, long a swing state, is back in play.